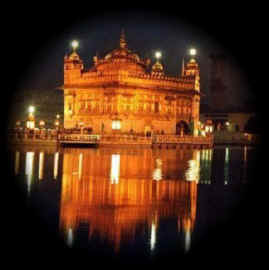 The Amrit means the purest water and Sar means Pond or Lake or Sarovar containing Amrit. It is only place in the world, the foundation stone of which was laid by a devotee belonging to other religion Miya Mir Ji a muslim by his religion laid the foundation stone of Shri Harminder Sahib. The four doors of Shri Harminder Sahib WELCOME people of all religions irrespective of their caste and creed. There is no distinction between the VIP and a common people (Raja and Rank). Its view in a moonlight is amazing. It seems that heaven has come on the earth. When the voice of sweet kirtan enter one's ears, it completely purifies one's soul and gives relief from the tensions of the hectic world. It is at this time a person thinks to give up all their luxuries and spend all his/her life there. In the Gurudwara there are two trees (Ber) (Ziziphus) . one of DUKH BHANJANI DE BER (Curer of sorrows) and other BABA BUDA JE DE BER, which cures people from their ailing health. It is believed that if one takes a dip in the Sarovar, ones sorrows and ailments get cured. If a newly married coupled while passing through the Baba Buda Je De Ber and a Ber suddenly falls in front of them means that Babaji has blessed with them a son. To get the blessings of Guru Sahib one should be pure physical as well as mental.. When you enter the Gurudwara Sahib first take a bath under the tap water in Srai ( a place meant for stay for people), change your cloths and then take a dip from the Sarovar, remember one thing you should not use soap there, only a dip as this is the amrit which cures all your ailments and when the voice of sweet kirtan enters your ears it automatically makes your soul pure but you have to be whole heartedly there. you have very good information. i have been in golden temple. i don't have words for explains of beautiness this place. but i heard in golden temple the guru granth sahib is nor original. It is not that book that kept in 1604. i want know where is the original book. why that is not here. i hope you will reply soon.